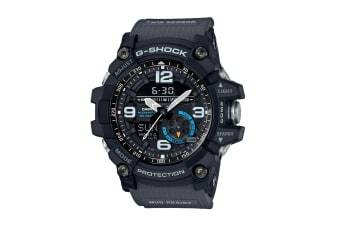 The Casio G-Shock Analog Mudmaster Watch features a Mud Resist construction that helps ensure that nothing gets into the watch when down and dirty work takes you deep into the dirt and sludge. 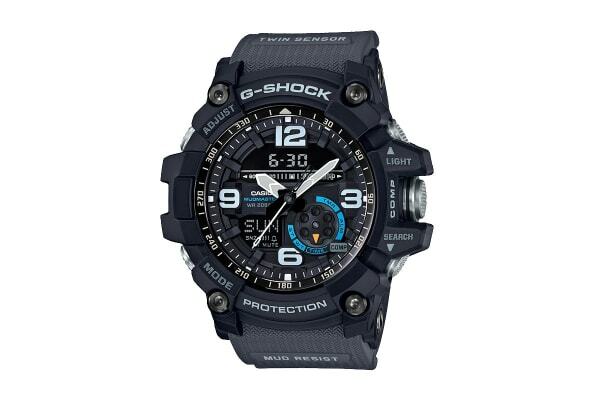 The face of the Casio G-Shock Analog Mudmaster Watch is marked with large Arabian numerals at 12, 3, 6 and 9 o’clock for easy reading. The face is illuminated by a Super Illuminator and high-brightness auto LED light to ensure high visibility under virtually any condition. Multiple gaskets are used on the pipes that guide buttons and shafts, which keep mud out. These pipes not only act to protect buttons from impact, they also enhance button operation. In addition, Twin Sensor capabilities provide instant access to direction and temperature information when needed under tough conditions. The hour and minute hands are shaped with points that make them resemble warning markers and the overall design is tough and rugged.